This fifth release in the SHOUT PRAISES! 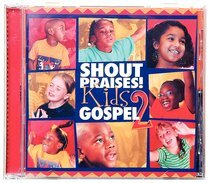 KIDS CD series features 12 high-energy worship songs made popular by artists like Alvin Slaughter, Darrell Evans, and Israel Houghton. With songs like 'Trading My Sorrows,' 'Shout,' and 'Freedom,' it's the perfect resource for children's choirs, VBS, summer camps, Sunday School, family worship, and more. About "Shout Praises! Kids Gospel #02"